We are not stopping with improvements and fixes to the patcher, what results in a much faster release of a new version. The list of changes in this update is rather long and that is why the post contains only the changes that are the most important and visible for users. Besides the changes shown below, we have managed to improve the stability of the patcher and expanded our server infrastructure. Applying patches has been sped up – patcher now ignores time-consuming diff applying in a case when the files are identical. It speed ups the time needed to install a game. Patcher now displays a name of an application in the window’s title. PatchKit’s logo has been added to the patchers without the white-label. After clicking on a logo, a user will be moved to the PatchKit’s website. A warning message has been added in case of a faulty configuration of the custom patcher build. Fixing broken data mechanism has been added before an update to a new version – it discards the need to download a whole game from the beginning in similar cases. An alternative version of patcher’s interface has been added; it contains double progress bar – the original one and the second one showing a progression of current operation (ex. downloading, unpacking, installing etc.). Every time the player runs the game, patcher now checks the correctness of the files, preventing to run broken game and eventually tries to take action in order to fix the game. Resume support to torrent downloading method has been added. It allows closing a patcher during downloading and reopen it later, which will continue a downloading process. A mechanism which blocks a running patcher without launcher has been improved (it makes sure that players will always use the newest version of a patcher, which is updated via launcher). 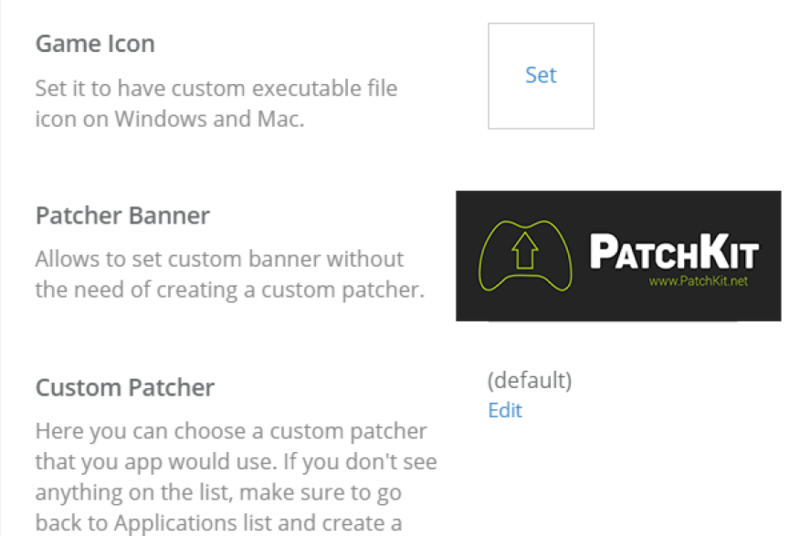 Patcher banner – allows setting custom banner without the need of creating a custom patcher. As always, with each new version released, please update all of your custom patchers to make sure your games’ patchers will run error-free. You don’t have to do anything if you don’t use a custom patcher.